131 million working days are lost to sickness absence every year, according to statistics released by The Work Foundation. But the cost to employers of ‘presenteeism’ (attending work while ill) is even more notable – an estimated £30bn annually. The main causes of lost working time are attributable to musculoskeletal conditions, minor illnesses (coughs and colds) and stress, anxiety or depression. The Health and Safety Executive backs up these statements, having just announced its new strategy for health in Britain’s workplaces, The Health and Work Strategy. Supported by the Minister of State for Disabled People, Health and Work, Penny Mordaunt MP, the strategy identifies that stress and musculoskeletal disorders account for around 80% of all working time lost due to illness. And the HSE estimates that a quarter of all of its enforcement notices issued to duty-holders concern issues around health in the workplace. Occupational stress and related mental health issues: Workers in all industries and in all sizes of business may be affected. In 2015/16 approximately 488,000 workers said they had experienced stress caused or aggravated by work. 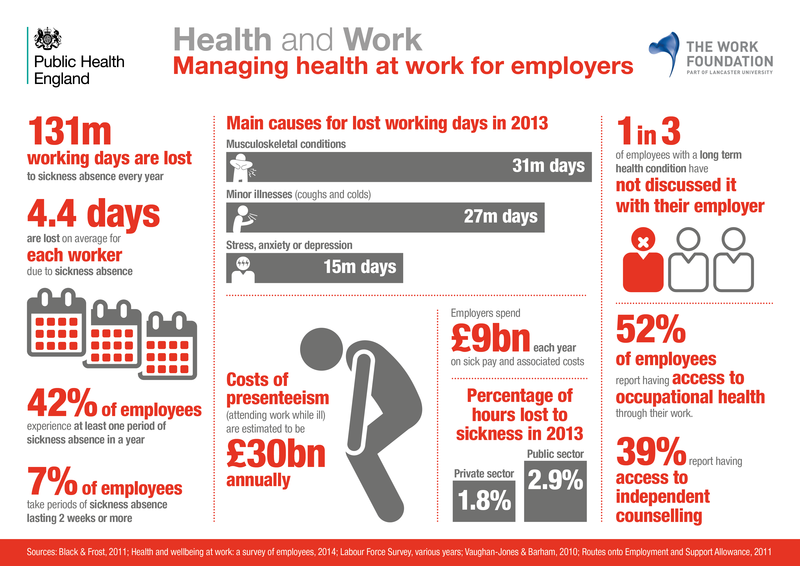 The HSE will be working with employers to reduce the number of new cases of ill health caused by work-related stress. Musculoskeletal disorders: Recognised as the most common reported cause of occupational ill health in Great Britain, in 2015/16 there were approximately 539,000 cases of musculoskeletal disorders, of which 176,000 were new, and 8.8 million working days were lost as a result. Occupational lung disease: Contributing substantially to work-related ill health in Great Britain, occupational lung disease continues to lead to an estimated 13,000 deaths each year. It includes a wide range of conditions from those that develop shortly after exposure (e.g. legionella infections, work-related asthma) to those that develop many years later such as pneumoconiosis, COPD, lung cancer and pleural mesothelioma, which are life-limiting and/or life-altering.